This had everything going against it for me. It was a sequel to a film I didn't care for. It was a prequel, which to me has always been boring. You have to REALLY know what you're doing if you want to pull off a prequel. Because let's face it, its hard to build tension or excitement when the audience already knows what happens. It also seemed like a really cheap, shameless way to pump out more money from a franchise that was already doing just fine. When Hollywood exploits a franchise's every corner in the name of stacked greenbacks, it annoys me. How could I actually like "Annabelle: Creation." Honestly, I think the low expectations may have helped. Well, at least sort of. "Annabelle: Creation" isn't a perfect film, heck I doubt I'd call it a great film. Its definitely not something I am going to put on my end-of-the-year lists, either of them I should add. There has already been plenty worst for a bad top ten, and I don't think this has chance to make the good top ten. 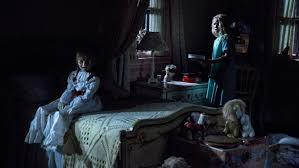 But "Annabelle: Creation" features some wicked scares, some squirmy atmosphere, and some young actresses that at the very least play convincing throughout. Its pretty clear that this movie is working overtime to show its audience how much they liked popular horror movies from the past. Its kind of boring throughout most of the film, and the story gets kind of silly at parts. But there is also a savage quality to it that I feel each horror film needs. The film begins in 1943, a couple that go by the last name Mullins are mourning the death of their young daughter after she is accidentally hit by a car. Soon after, the Mullins believe that their dead daughter's spirit is talking to them, and Mr. Mullins (Anthony LaPaglia) creates a porcelain doll to put their daughter's spirit in. Sadly, they are communicating with a demon. They lock Mr. Mullins doll in a room and leave it their for priests. Twelve years later, Sister Charlotte (Stephanie Sigman) and a group of girls are homeless after her orphanage closes. The Mullins bring Sister Charlotte and the girls in. Janice (Talitha Bateman) is a sickly girl with polio, and she begins to be stalked by the demon that resides in the Mullins house, all the demon ever wanted was a human host, and now through Janice, it just might get it. So that's pretty much the plot. It plays like a regular haunted house movie, and for most of its running time, it does a good job. Like I said, there are some good scares in the movie, but not enough that I feel can carry a whole movie. Horror films with children in them are always tricky, because its tough to get it scary without disturbing your audience. I think the film benefits by delving into darker territory, I just don't think they ever get the most out of what they are trying to do with their material. Plus, like I said above, its a bit of a drag in most spots, and the pace just never keeps up. But this is a step up from "Annabelle" so I think that's slam dunk in itself. The performances range from good to mediocre. I think Sigman, who I absolutely loved in "Miss Bala," does what she can to make the script work, as does Talitha Bateman. Miranda Otto shows up as Mrs. Mullins and her performance is fine. She's capable of doing better, but she's nothing out of whack. She's a little hammy here, and it keeps her from contributing to the spooky atmosphere this film is so clearly trying to achieve. The girls among the orphanage do a good job running around and screaming at the dark, which I guess is what they were hired to do. This "Conjuring Universe-Franchise" is not going anywhere anytime soon. And heck, I'll admit it, not every movie in any franchise shines from point A to point B. "Annabelle" may have been a step down, but "Annabelle: Creation" is the sprint up the incline on a large hill. It maybe hard, but its getting to the top. This isn't a perfect horror movie, but it just might be what you're looking for as the summer movie season dwindles down.